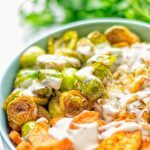 This Cajun Sweet Potato Brussels Sprout Salad is amazingly delicious plus super easy to make. Naturally vegan and gluten free. Start with the sweet potatoes. Wash and peel them, cut into cubes. In a bowl, mix with the olive oil, Cajun seasoning, and season with salt and pepper. Place on sheet pan. Next prepare the other veggies: clean the used bowl for the sweet potatoes and add clean and shaved Brussels sprouts, onions, olive oil, balsamic vinegar, and optional maple syrup. Season with salt and pepper. Distribute all on the same sheet pan like you did with the sweet potatoes. Bake everything for around 25 minutes at 410°F. When done, transfer to bowls or plates. Serve with optional add ons like cooked quinoa and tahini sauce.